The revolution in wireless communications calls for a new focus in the electrical engineering curriculum. 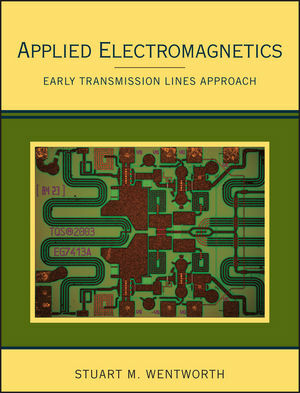 Stuart M. Wentworth fills that need with his new Applied Electromagnetics: A Transmission Lines First Approach. Incorporating the popular MATLAB program throughout, it features practical applications for wireless systems, transmission lines, waveguides (including optical fiber), antennas, and microwave systems. Designed for use in a one- or two-semester sequence at the junior and senior level, it offers students both detailed theoretical grounding and hands-on experience in harmony with today’s professional practice. Stuart M. Wentworth received his B.S degree in Chemical Engineering from Auburn University, Alabama, in 1982 and his M.S. (1987) and Ph.D. (1990) degrees in Electrical Engineering from the University of Texas at Austin. He has been a member of the Electrical & Computer Engineering faculty at Auburn University, Alabama since 1990. Dr. Wentworth's research has focused on the high frequency characterization of materials used for electronics packaging. 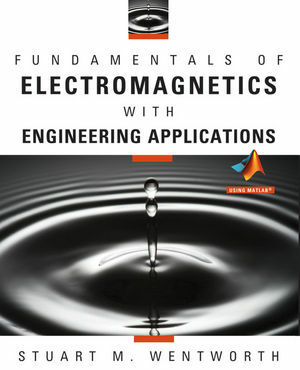 He is the author of Fundamentals of Electromagnetics with Engineering Applications (Wiley). Dr. Wentworth has received numerous teaching awards at Auburn University, including the Birdsong Merit Teaching Award in 1999. He is a Senior Member of the Institute of Electrical and Electronics Engineers (IEEE). MATLAB 2.3 shows when connecting wire must be treated as transmission line. The student can see WHY the T-Line model is required, rather than just accepting some minimum length criteria on faith. In MATLAB example 8.4, a movie is created showing the radiation pattern from a dipole antenna as its length changes. In MATLAB problem 2.18, students are asked to compare the field from a segment of charge to the field from an infinite length line of charge. The problem is similar to MATLAB example 2.3, so the programming is not difficult. Students are able to see that theory for an unrealistic infinite line can be put into practice in some situations.